As a creatine transporter we propose to dissolve 1 portion of Dextrex Juice (around 40 g i.e. 65 units of Olimp scoop or 4 flat tablespoons) in a glass of water. In such a prepared beverage dissolve the established creatine portion (3-10g). 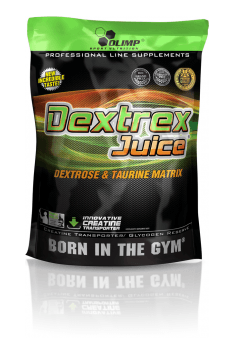 Dextrex Juice may be also used as an additive to nutritional supplements or as a carbohydrate preparation by itself, which complements glycogen supplies. It is best to use after training at the dose of 20-60 g per portion; in this period we propose to join it with a high-protein preparation, e.g. Whey Protein Complex 100% (around 20-50 g). On non-workout days you may skip using the product. The pre-workout consumption of the supplement should be combined with creatine, which, thanks to the content of taurine and insulin activity, will be efficiently transported to the skeletal muscles. On the other hand, the post-workout consumption should be combined with protein supplements or amino acids, which contribute to the recovery of the skeletal muscles. The supplement can also be used alone- without combining it with other products, because it provides easily absorbable energy and increases the daily supply of calories. The supplement is recommended especially to people who perform long-term exertion, such as running or cycling, as well as people practicing martial arts.